We would like to share with you again an interesting blog from Mark Scantlebury, writer for the high tech industry. While editing articles for the upcoming April issue of Embedded Innovator magazine, I noticed that there is a major effort underway to make it easier to implement and scale digital signage systems. Where once there was just the Open Pluggable Specification (OPS), now there’s also the Intel® Intelligent Systems Framework. 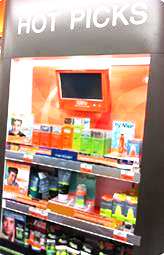 Real products on display stands is a standard way to promote products in the cosmetics industry. If customers cannot find products that are suitable for them, display stands can provide customers with experiences to touch, feel, and try different cosmetics products via an interactive screen, and thereby motivating them to make qualified purchase decisions.